Guigal is the most famous name in the Rhone valley. They produce great wines from a myriad of appellations all over the Rhone valley. Aside from Hermitage Guigal is famous for making great wine in Cote Rotie, Condrieu. St. Joseph, Crozes Hermitage. Chateauneuf du Pape, Gigondas, Tavel and Cotes du Rhone. Their top Cote Rotie wines are the quality benchmark for the appellation. Starting with 2001, Guigal is striving to lay a claim that their top Hermitage wine, Guigal Ex Voto, is the benchmark wine for the Hermitage appellation as well. Guigal Ex Voto made its first vintage in 2001. Guigal is the leading negociant for the Rhone valley. In Cote Rotie, Guigal vinifies an astonishing 40% of all wine produced in the Northern Rhone Valley appellation of Hermitage! Amazingly, all this was accomplished in less than 60 years. nder a decade is even more incredible. Eitenne Guigal got his start in the St. Etienne area when he took a job with Vidal Fleury. After 15 years at the firm he left in 1946 and formed Ets. Guigal. Ets is the abbreviation for Establissements. Then in 1984, Guigal purchased the firm that gave him his start, Vidal Fleury. Etienne passed way in 1988 at the age of 79. Marcel Guigal was managing the properties by that time. Philippe, the only son of Marcel was born in 1975. The company continued adding to their Hermitage holdings in 2001 with the purchase of vineyards that belonged to Jean-Louis Grippa, and more importantly, those of Domaine Vallouit. Those purchases allowed Guigal to finally enter the competition for producing the finest wine from hermitage with Ex Voto. Guigal Ex Voto takes its name from the Latin phrase, “In consequence of a wish.” The wine is only produced in the best years. Production is limited to under 800 cases per vintage. with 0.45 Hectares and Hermite with 0.45 hectares. The terroir varies as you might expect, but much of it is planted on the steep, granite hillside soils although you can also find rocks, stones with some clay and sand in the soil. On average the vines are more than 35 years of age. The best vintages of Guigal Ex Voto are: 2018, 2017, 2016, 2015, 2012, 2010, 2009, 2007, 2005, 2003 and 2001. To produce the wine, Guigal Ex Voto rouge receives some of the same deluxe treatment utilized in Cote Rotie. Guigal Ex Voto is aged in 100% new, French oak barrels for 30-36 months before bottling. Over the years, Guigal has decided to reduce the amount of time the wine spends in barrel, hoping to add more freshness and less of an oak influence to the wine. Guigal Ex Voto Rouge is not made every year. The wine, which is meant to compete with the best wines in the appellation is only produced in the top vintages. 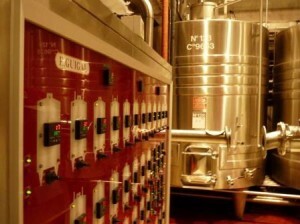 Guigal also continues to produce a standard red Hermitage wine, which they have made for decades. Not much wines is made as the production of Guigal Ex Voto is close to 600 cases, when the wine is produced. The white wine grapes used to produce Guigal Ex Voto Blanc are planted on Murets with 1.6 hectares and .02 hectares are found in another lieu-dit. The white wine grapes are planted to 90% Marsanne and 10% Roussanne. The terroir is rocks, small stones, clay, sand and limestone soils. The vines are old, ranging in age from 50 to 90 years of age. Guigal Ex Voto Blanc is produced from a blend of 90% Marsanne and 10% Roussanne, the same as the vineyard planting. The white wine is aged in 100% new, French oak barrels. Guigal also produces a standard Hermitage white wine. The production hovers at just over 500 cases of wine. Guigal Ex Voto rouge is a stunning wine. Polished, rich, soft, round and deep, this mineral driven wine is filled with layers of dense ripe, black fruit, spice, earth and stone. The 2003 Guigal Hermitage Ex Voto tasted recently was mind blowing! Guigal Ex Voto Hermitage when young, should be decanted at least 3-4 hours, give or take, allowing the wines to soften and open their perfume. Older vintages might need very little decanting, just enough to remove the sediment. Guigal Ex Voto Hermitage is usually better with 10-12 years of cellaring and should be at its best between 12-35 years of age. d at 15.5 degrees Celsius, 60 degrees Fahrenheit. The cool, almost cellar temperature gives the wine more freshness and lift. Guigal Hermitage is best served with all types of classic meat dishes, veal, pork, beef, lamb, duck, game, roast chicken, roasted, braised and grilled dishes. Guigal Hermitage is also good with Asian dishes, hearty fish courses like tuna, mushrooms and pasta. The white wine of Guigal Hermitage is best served with a myriad of different seafood dishes, shellfish, crab, lobster, sushi, sashimi, chicken, pork and veal, as well as Asian cuisine. In addition to Ex Voto, Guigal produces a standard red Hermitage, from vines that are about 30 years of age, that is aged in 50% new, oak barrels which is a lot less money and much easier to find than the Ex Voto as the production for the red Guigal Hermitage averages 7,000 cases per year. The standard Guigal Hermitage Blanc is blended from 95% Marsanne, 5% Roussanne and is aged in one year old barrels for 24 months before bottling. The annual production is close to 2,000 cases for each vintage.